Phoebe Cassini Target - Universe Galaxies And Stars Section. orbit around Saturn: Image credit: NASA/JPL/Space Science Institute. Now only three weeks from entering orbit around Saturn, it's time for Cassini to begin making some close up observations. Its first target is the tiny Moon Phoebe, which is only 220 kilometres (137 miles) across. The images are already better than anything taken by Voyager 2, and show a varied surface, with mountains and craters. Cassini will get its best view on June 11 when it zooms past the Moon at a distance of only 2,000 kilometres (1,240 miles). It should have enough resolution at the point to see objects the size of office buildings. The three images shown here, the latest of which is twice as good as any image returned by the Voyager 2 spacecraft in 1981, were captured in the past week on approach to this outer Moon of Saturn. Phoebe's surface is already showing a great deal of contrast, most likely indicative of topography, such as tall sunlit peaks and deep shadowy craters, as well as genuine variation in the reflectivity of its surface materials. Left to right, the three views were captured at a Sun-Saturn-spacecraft, or phase, angle of 87 degrees between June 4 and June 7, from distances ranging from 4.1 million km (2.6 million miles) to 2.5 million km (1.5 million miles). The image scale ranges from 25 to 15 km (16 to 9 miles) per pixel. The images have been magnified eight times using a linear interpolation scheme; the contrast has been untouched. 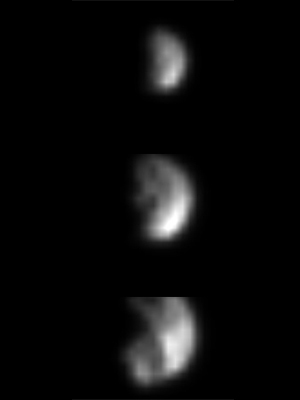 Phoebe rotates once every 9 hours and 16 minutes; each of these images shows a different region on Phoebe. Cassini's powerful cameras will provide the best-ever look at this Moon on Friday, June 11, when the spacecraft will streak past Phoebe at a distance of only about 2,000 kilometers (1,240 miles) from the moon's surface. The current images, and the presence of large craters, promise a heavily cratered surface which will come into sharp view over the next few days when image scales should shrink to a few 10's of meters...the size of office buildings. Because of its small size and retrograde orbit - Phoebe orbits Saturn in a direction opposite to that of the larger inner Saturnian moons - and because of the presence of water ice on its surface, Phoebe is believed to be a body from the distant outer solar system, one of the building blocks of the outer planets that was captured into orbit around Saturn. If true, the little Moon will provide a windfall of precious information about a primitive piece of the solar system that has never before been explored up close. Phoebe was the first Moon discovered using photography in 1898 and has a very dark surface. It has long been believed that material coming from Phoebe's surface and impacting the very dark leading hemisphere of Iapetus may play some role in thelatter's extreme albedo asymmetry, though the precise relationship is unclear. Cassini should help solve this and other mysteries during its exciting encounter with Phoebe. The Cassini-Huygens mission is a cooperative project of NASA, the European Space Agency and the Italian Space Agency. The Jet Propulsion Laboratory, a division of the California Institute of Technology in Pasadena, manages the Cassini-Huygens mission for NASA's Office of Space Science, Washington, D.C. The imaging team is based at the Space Science Institute, Boulder, Colorado.